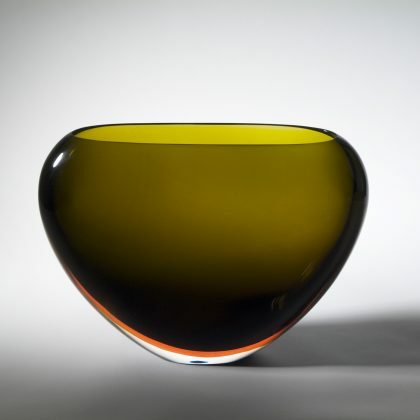 The exhibition is the result of intense archival research by Marc Heiremans, expert in 20th-century Italian glass art. Some 190 magnificent glass objects, piece by piece bearing witness to outstanding craftsmanship, illustrate the story of this Venetian glass artist family. The company was founded in 1932 by the glassblowers Napoleone Barovier, Luigi Olimpio Ferro and Antonio Seguso. Vittorio Zecchin provided artistic direction in the beginning. In 1934 Flavio Poli joins the factory, and the company is given the name ‘Seguso Vetri d’Arte’. Until 1963, when Poli leaves the company, he will be responsible for the artistic level of the production. As early as 1942, Archimede Seguso left the company where he had been working as master glassblower, to start his own company ‘Vetreria Archimede Seguso’ in 1946.